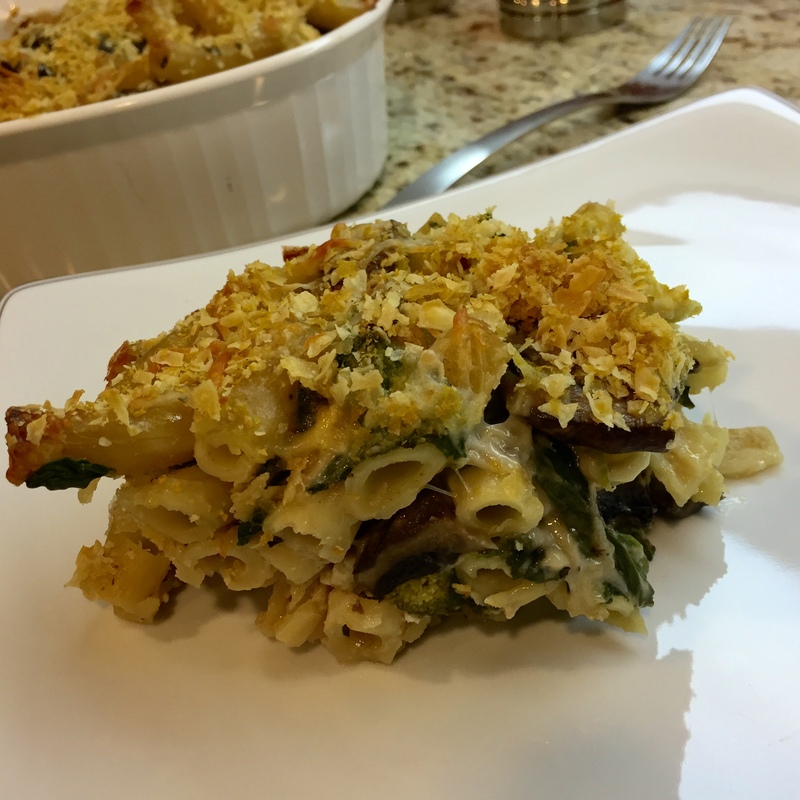 I dreamt about this recipe after some late night Mac n Cheese talk with my love. (Yes, we’re always hungry!) We’ve really been watching our calories lately and both missed that decadent Mac and Cheese we ate on our first date at The Den on Sunset. I knew I had to have it and I knew there was a way to make it without all the guilt. 2. Sauté your mushrooms in a teaspoon of olive oil over medium high heat for about 3 – 5 mins stirring occasionally to get all sides browned. Add garlic powder and oregano and remove from heat. 3. Resist from eating all the mushrooms right out of the pan. 4. Break up broccoli florets into bite sized pieces. And munch on the raw stems; you won’t need these for the recipe but they’re good for you so don’t throw them away. 5. Call your significant other and get them excited about dinner tonight. Stay discreet. 6. Add raw broccoli and spinach to your pasta strainer and leave in the sink. You’ll eventually drain the pasta over the veggies causing the spinach to wilt and the broccoli to warm through. 7. Wait til your pasta is al dente then do the last part of step 6. Leave a few tablespoons of pasta water in the pot. This will help thicken your sauce a bit. 10. Crack an egg into a separate bowl and mix to get the yolk and whites combined. 11. Are you still with me? 12. Add egg to bowl and mix everything really well. 13. Transfer to a baking dish that’s been lightly sprayed with cooking oil. 16. I had some thin parchment crackers in the house so I threw them in a zip lock bag and smashed em up to a bread crumb consistency. I added some nutritional yeast to that for a nutty flavor and used this as my bread crumb topping. You can do this or buy some Italian bread crumbs & sprinkle on top. Or you can skip this step all together. It will still be DELICIOUS! 15. 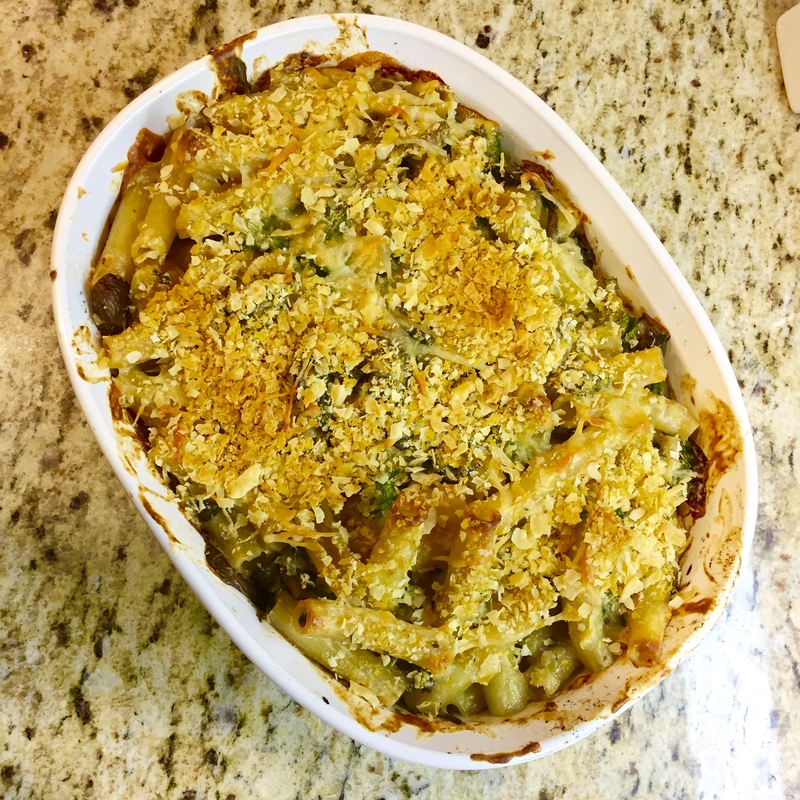 Bake Pasta for about 20 – 25 minutes & broil on high for 3 mins. Let it cool for a while before you taste. Trust me. Dont be Chilly, Eat some Chili!